In today’s tricky economy, things are getting more expensive and costly all of the time. A great way to save money for the family is by home laundering your baby’s cloth diapers. We are all for the DIY spirit when it comes to doing-it-yourself with eco-friendly methods. Granted not everyone has the time to do household chores from start to finish, but if home laundering is something you want to fit into your busy parenting schedule, consider the following helpful tips to make the most out of your green laundering experience. + If your baby is exclusively breastfed, there’s no need to shake out or flush waste. Simply throw soiled and wet diapers in the same receptacle and everything should come out in the wash.
+ On wash day, dump diapers into the washer and run them through the rinse cycle, setting the water temperature to cold. Don’t add soap yet. + After the rinse cycle, add detergent. Use about ¼ the amount of soap you would use for a comparable sized load of clothes. Too much soap causes rashes. Use the “heavy soil” setting and choose hot water for this cycle, after which the diapers should be completely clean. Dry as desired. + When baby begins solid foods, it’s time to start flushing solid waste. Shake soiled diapers over your toilet bowl, which will be enough in most cases. Very messy diapers should be scraped out (this is where the rubber spatula alongside the toilet brush comes in handy!) or swished around in the toilet bowl. + Soiled diapers do not need to be soaked, as was the tradition once upon a time. Once the waste is removed, place all diapers in the same receptacle and wash as instructed above. This is called the dry pail method, and most parents find it more effective and agreeable than the soaking involved in the traditional wet pail method. + Some parents find that adding ½ cup of baking soda to the wash cycle, and ½ cup vinegar to the final rinse make diapers extra clean. 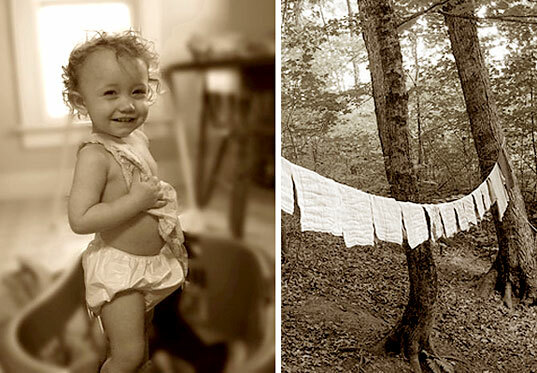 +If you have access to an outdoor clothes line, try hanging your diapers out to dry every so often. You’ll be surprised how much whiter they become! If parents keep an open mind, home laundering is very easy. I have found the familiarity of the routine to be enjoyable, and the obvious results of the task are something to be proud of! Cloth diapers were the only choice 30 years ago when I had my kids. We used to have a laundry room with a pail of water with baking soda, when it was full (a dozen diapers or more), we threw the smelly water away, place them in the stove with clean water to boil for a while, then to the washer with that same hot water, wash ,and rinse twice. If you had drying machine it was o.k., if not, we used to iron them to kill any bacteria left. Nobody questioned this job, it was just like that. I encourage young couples to try with at least two dozens for at home diapering...it is good to renew things, but if they finally harm us, lets avoid them. The only trouble Ive found in this days is that there�s no plastic pants�at the grocery store, only expensive exclusive alternatives. Hope this long time ago way of doing it helps someone. Laura Oreamuno San Jose, Costa Rica. Central America. If your looking for "plastic pants" then try Dappi's Nylon Pull up diaper covers. Those are what I have been using for a couple years and they are GREAT and CHEAP!! Plus much more comfortable than plastic.